The Zanzibar Bishop was formally described by John Cassin, an American ornithologist and curator of the Philadelphia Academy of Natural Sciences. It is not known who collected the Zanzibar Bishop. The earliest record of the type specimen is in the possession of Victor Massena, Duc de Rivoli, Prince d'Esling, a French amateur ornithologist living in Paris. Rivoli had a large collection of birds, about 12500 specimens, which were bought by the Academy of Natural Sciences of Drexel University, formerly the Academy of Natural Sciences of Philadelphia (ANSP), the oldest natural science research institution and museum in the New World. 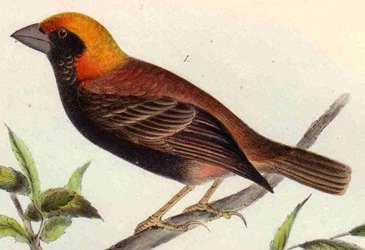 The collection arrived in Philadelphia in September 1846 (Stone 1899) and Cassin described many of these specimens as new bird species, including the Zanzibar Bishop. The first illustration of a Zanzibar Bishop is a colour painting published by Cassin 1849. 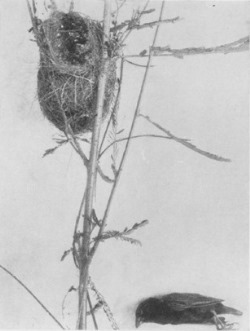 The second illustration was published some 80 years later, a black and white photo of a nest and specimen by Bowen 1931. Euplectes nigroventris	Cassin 1848	Proc. Acad. Nat. Sci. Philadelphia, 4, p.66,	Zanzibar Island. nigriventris - Latin: niger, black; venter, ventris, the belly. Black-bellied Bishop, Black-bellied Grenadier, Black-bellied Weaver, Black-throated Bishop-bird, Black-vented Widowbird, Ukamba Red Bishop, Zanzibar Red Bishop, Zanzibar Red Weaver. Unknown, part of the Rivoli collection. Before 1846, but date unknown. ANSP 14301 in Academy of Natural Sciences of Drexel University. Identification. The Zanzibar Bishop is a small East African bishop. The breeding male (photo left) is red and black, and is distinuished from similar bishops by an entirely red crown and forehead and lack of a red breast-band on the black underparts; it differs from the sympatric Black-winged Bishop by a short brown tail, brown wings, and red undertail-coverts. 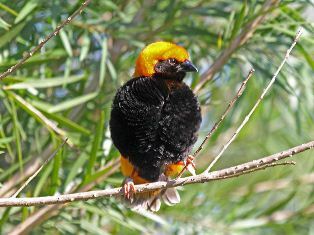 The female (photo below) and non-breeding male are smaller than the Black-winged Bishop, with a shorter bill, and with a duller buff breast-band. Distribution. 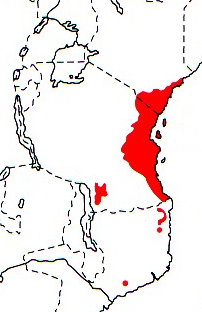 The Zanzibar Bishop is found along the coastal belt of south-east Kenya, southwards from Lamu; in Tanzania, on the coast including Zanzibar and Pemba Islands, westwards along the Pangani River, and an isolated inland population that is west of Songea; in northern Mozambique the distribution is less clear but occurs at Mocuba (see map below, based on Birds of Africa). No subspecies of the Zanzibar Bishop are recognised. Habitat. 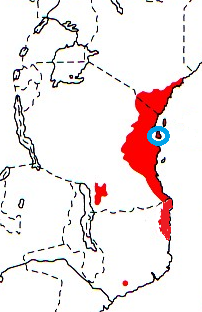 The Zanzibar Bishop inhabits coastal grasslands and cultivation. It is found in flocks, often with Black-winged Bishops, or other bishops and queleas. Food. The Zanzibar Bishop feeds on grass seeds of Echinochloa haploclada, Panicum maximum, sorghum and rice. It readily feeds on termites and spiders in captivity. Their young are fed on insects. Breeding. The Zanzibar Bishop is territorial, and polygynous, with up to 5 females per male. The nest (photo below) is a thin-walled oval structure of coarse grass with a side entrance, and grass heads project over the entrance to form a small porch. The nest is built by the male, but the female adds the lining of seed-heads of grasses such as Panicum maximum. The nest is attached to grass, bushes or reed stems, usually 1-1.5m above the ground. Early in the season, nests are usually placed in reeds or bulrushes. The eggs are pale blue, rarely with sparse brown speckles. The female incubates the eggs and feeds the chicks. In Mombasa, House Crows Corvus splendens are predators on eggs and young of this species. The first 2 PHOWN records of the Zanzibar Bishop are both from Dar es Salaam, at a constructed wetland. The records were submitted by Anne Outwater, who provided lots of detail about the breeding attempts of this species: the female successfully raised chicks. Read more at the PHOWN record 683; also see news item.